Gardens are a beehive of activity, compliments of Mother Nature. 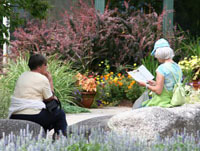 And with the addition of some great programming, there is an almost endless list of ways you can enjoy the Gardens. Check out our top 101 of them! DROP a leaf into the water then watch it sail merrily away downstream. PINCH your nose when the Skunk Flower (Cleome) is in bloom. STAND among the magnolias and take in the incredibly sweet scent. LAY on your belly and shoot the May Apples blossoms under their canopy of leaves. GET up close and personal with the Japanese Tree Lilac and its sweet aroma in the courtyard. 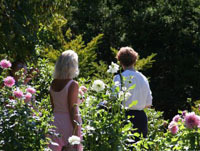 NAVIGATE through the Gardens using a GPS. BEND OVER to smell each rose. ADMIRE the architecture of the laburnum arbour. LOOK waaaaay up at the Kalopanax and see flower clusters and huge thorns on its trunk. CONTEMPLATE the Gooseneck Loosestrife and determine which direction you think it is heading. DON'T RESIST the urge to hum to yourself. EMPATHIZE with Acadian women who had to raise children in such a small house. MARVEL at bountiful harvests grown in Acadian gardens. SEARCH for things 'out of the ordinary' such as the diamond bark of the Korean Mountain Ash. POINT your camera upwards while standing under a Magnolia and snap a picture against the blue sky. CELEBRATE in your heart all the colors, shapes, sizes and aromas. 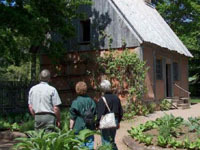 LEARN new ways to garden from the Innovative Garden. LOOK at pictures from the Garden's beginnings. ADMIRE metal sculptures by a local artist. HAVE FUN doing a scavenger hunt with the kids. PARTICIPATE in a guided tour. FEEL the wind through your hair on the dykes. WATCH birds fly from tree to tree. GAIN knowledge regarding plant names. WALK AND TALK with your partner. BREATHE in the fresh clean air. WELCOME the friendly little chipmunk looking for a treat. PRUNE the roses with the Rose Lady. RAKE the paths with the Gardeners. CHECK OUT the giant leaves of the Pawlonia Tree. EXAMINE the agate in the Shop. SWING WIDE around the bees nest. TREAD SOFTLY by the deer and fawn on the marsh. SHIVER as the north wind blows up a gale. MARVEL at all the hues of heather. FOLLOW your shadow across the marsh. LEAD the way through the pine forest. INHALE the sweet smell of the Katsura in autumn. LEARN something new at one of the workshops. SIT BACK and listen to the sounds of music. TRY one of the delicious specialty coffees from the café . PICK UP some tips from the gardeners. SEARCH OUT the funky feature of the week. SAMPLE some local wines during one of the outdoor evening wine and cheese soirees at the Gardens. INTRODUCE YOURSELF to staff and volunteers. They love to chat! PURCHASE a Season Pass - then you can visit every day! SIGN UP for the weekly Bloom Report - then you will know when your favourites are blossoming. TAKE NOTES of your adventures and tell your friends back home. COMMENT on your visit in a Visitor Survey. WATCH OUT for falling acorns! PUT UP your umbrella. It'll protect against rain and sun. FILE all your beautiful memories away for days of remembering whenever.